And from which she will never return. But it’s not the glory she seeks to earn. In search of a kinder season. In temperatures that are well within reason. Will save them from winter snow. To make it in Life, Death, and Taxonomy. Wingspan: 8.9–10.2 cm ( 3.5–4 in) – 9.5 cm – How many monarch butterflies go into the wingspan of a wandering albatross (10ft), the largest flying bird? Hint: They lay eggs that are 4 inches long. Answer: 32 monarchs. The American monarch butterfly migrates the longest. They live all over the world but other regions don’t require as long a migration. They migrate back and forth between the North America and Mexico. Monarchs to the east of the Rockies travel to Mexico. West of the Rockies travel to California. The journey can span as much as 3,000 miles every year. They travel to warmer regions to hibernate and wait out the winter months. They spend as much time as they can in the flower-draped meadows of the Northern U.S. and Canada. But when the sun peaks at 52 degrees above the horizon, it triggers a great migration. When winter is over they travel back to the northern states and Canada where spring brings a veritable smorgasbord of flowers and nectar. The plants they eat in their larval stage aren’t in their overwintering sites. In Mexico, the hibernate in oyamel fir trees that have large canopies that provide climate control and incubate the bugs. The cool mountain air slows their metabolisms. They enjoy perfectly temperate weather. If you were to see one of these trees in winter, it would be covered from treetop to trunk stop in butterflies. After hibernation, they pack up and head back north to get that sweet nectar. Monarch live for about 2 to 4 weeks as adult butterflies. SO HOW CAN THEY MAKE IT BACK UP NORTH IN THAT AMOUNT OF TIME?! They don’t. It may take monarchs four to five generations to make it all the way to their spring and summer destinations. Along the way, butterflies will stop in milkweed patches, lay eggs, die, and then caterpillars hatch, gorge on milkweed several times their body weight, pupate, emerge, and continue the journey north. THAT’S AMAZING! SO IT’S THE SAME ON THE WAY SOUTH? Nope. After enjoying several months in flower paradise, a super healthy, special generation is born. This generation can live for up to eight weeks. They catch air currents that carry them all the way south in one go. And the cycle continues. How do they know where to go? No one knows for sure. -They follow milkweed blooms going north. As winter gives way to spring, milkweed blooms in warm regions first and spreads north. Winter kills milkweed plants in the same pattern going back. -They migrate based on their position to the sun. -They have a genetic memory. Something in their DNA tells them where to go like a memory passed from one generation to the next. You’ve made it. You’ve reached the end of a journey of over a thousand seconds. Unlike the monarch butterfly, you’ve lived to receive your reward. Which is a clear and clever call to action. Here it is: please leave us a review on iTunes or wherever you get your podcasts. That’s it. Go. Take it and love it. 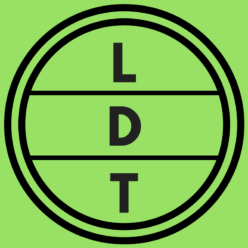 Oh and also, come find us on Facebook, Twitter, and Instagram by searching ldtaxonomy! Is that not a satisfactory reward?